The HP Proliant BL460c Gen8 blade server is a data center favorite with enhanced flexibility, unprecedented performance, and simplified management. As part of HP's c-Class BladeSystem infrastructure, the BL460c Gen8 blade is compatible with the BLc7000 and BLc3000 blade enclosure. As a half-height server blade, the c7000 enclosure can fit up to 16 total BL460c's and the c3000 can fit up to 8 total BL460c server blades installed. HP's c-Class enclosures support multiple models and generations installed simultaneously to accommodate varying application demands with the appropriate hardware solution. With their modular design, HP's ProLiant c-Class blade servers are perfect solution for customers interested in consolidating their servers or clustering applications. The shared infrastructure of c7000 or c3000 enclosures include power supplies, fans, interconnect modules and backplanes for improved power efficiency and reduced operating costs. The BL460c Gen8 is a dual socket, half-height blade server powered by Intel Xeon E5-2600 v2 processors for up to twelve cores and 30MB cache per CPU. Sixteen dual in-line memory module (DIMM) slots supports up to 512GB DDR3 memory operating at a maximum speed of 1866MHz. Two 2.5" hot-plug hard drive bays support 6Gb/s SAS or SATA hard drives, as well as solid state drives. Aventis Systems includes the Smart Array P220i 6Gb/s RAID controller with 512MB flash-backed write cache, as well as optional external storage RAID controllers to allow for external shared storage systems like the HP StorageWorks P2000. HP's FlexibleLOM provides a choice of bandwidth and fabric to customize your server networking today and adapt to meet future needs without overhauling server hardware. Mezzanine network interface cards (NICs) and host bus adapters (HBAs) paired with the improved latency of PCIe 3.0 technology support a variety of fabrics (ethernet, fibre channel, SAS etc.). Please browse our BL460c Gen8 models below! Aventis Systems carries Aventis Systems Certified Reconditioned condition on all HP ProLiant BL460c G8 Blade servers with upgrades available to New. All servers from Aventis System include a 3 year Comprehensive Warranty, with eligibility for optional Extended, Express, and Secure Drive Warranties as well as Onsite Services. 512GB (2 x 256GB) SSD 6Gb/s SATA 2.5"
Are you just beginning to build your blade server infrastructure and looking for a complete, out-of-the-box blade server solution? 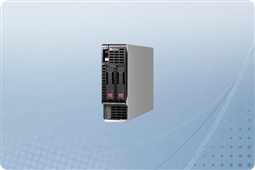 Please browse our HP ProLiant BLc7000 with blade servers installed. We offer half-populated and fully-populated enclosures with popular HP blade models and robust interconnect options for a custom BladeSystem to meet your business needs. Not sure where to start? Our knowledgeable sales and technical support teams are happy to help! Please use our Live Chat Live Chat or call us at 1.855.AVENTIS (283.6847) during regular business hours, or email us at Sales@AventisSystems.com.